Statistics 2e teaches statistics with a modern, data-analytic approach that uses graphing calculators and statistical software. It allows more emphasis to be put on statistical concepts and data analysis rather than following recipes for calculations. 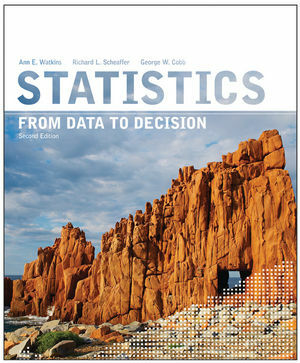 This gives readers a more realistic understanding of both the theoretical and practical applications of statistics, giving them the ability to master the subject. 1 Statistical Reasoning: Investigating a Claim of Discrimination. 1.1 Discrimination in the Workplace: Data Exploration. 1.2 Discrimination in the Workplace: Inference. 2 Exploring Distributions of Data. 2.1 Visualizing Distributions: Shape, Center, and Spread. 2.2 Summarizing Center and Spread. 2.3 Working with Summary Statistics. 3 Relationship between Two Quantitative Variables. 3.2 Regression: Getting a Line on the Pattern. 3.3 Correlation: The Strength of a Linear Trend. 3.4 Diagnostics: Looking for Features That the Summaries Miss. 4 Sample Surveys and Experiments. 4.1 Random Sampling: Playing It Safe by Taking Chances. 4.2 Why Take Samples, and How Not To. 4.3 Experiments and Inference about Cause. 4.4 Designing Experiments to Reduce Variability. 5.1 Models of Random Behavior. 5.2 The Addition Rule and Disjoint Events. 5.3 Conditional Probability and the Multiplication Rule. 6.1 Probability Distributions and Expected Value. 6.2 Rules for Means and Variances of Probability Distributions. 7.2 Sampling Distribution of the Sample Mean. 7.3 Sampling Distribution of the Sample Proportion. 8 Inference for a Proportion. 8.1 A Confidence Interval for a Proportion. 8.2 A Significance Test for a Proportion: Interpreting a P-Value. 8.3 A Significance Test for a Proportion: Making a Decision. 8.4 Types of Errors and Power of a Test. 9 Comparing Two Populations: Inference for the Difference of Two Proportions. 9.1 A Confidence Interval for the Difference of Two Proportions. 9.2 A Significance Test for the Difference of Two Proportions. 9.3 Inference for Experiments and Observational Studies. 10.1 A Confidence Interval for a Mean. 10.2 A Significance Test for a Mean: Interpreting a P-Value. 11 Comparing Two Populations: Inference for the Difference of Two Means. 11.1 A Confidence Interval for the Difference of Two Means. 11.2 A Significance Test for the Difference of Two Means. 11.3 Inference for Paired Comparisons. 12.1 Testing a Probability Model: The Chi-Square Goodness-of-Fit Test. 12.2 The Chi-Square Test of Homogeneity. 12.3 The Chi-Square Test of Independence. 13.1 Variation in the Slope from Sample to Sample. 13.2 Making Inferences about Slopes. 14 One- Way Analysis of Variance. 14.1 A New Look at the Two-Sample t-Test. 14.2 One-Way ANOVA: When There Are More Than Two Groups. 15.1 From One to Two Explanatory Variables. 16 Martin vs. Westvaco Revisited: Testing for Possible Discrimination in the Workplace. Table A: Standard Normal Probabilities. Table B: t-Distribution Critical Values. Table C: x2 Critical Values. Table D: F-Distribution Critical Values for α=0.05. Brief Answers to Practice Problems and Selected Exercises. The name of the book has been changed to highlight two emphases of the college-level course. An informed citizen understands where data come from and has a feel for data and how to assess it. Also, familiarity with statistics as a discipline and mindset leads to critical thinking and sound decision making. The author team revamped the table of contents. Chapter 3 (Relationships Between Two Quantitative Variables) was streamlined to focus on the descriptive statistics for correlation and regression covered in the college course. Chapter 6 was heavily rewritten and reorganized, highlighting the big ideas of probability distributions—especially the binomial setting and binomial distribution. Finally, Chapter 16 (Martin vs. Westvaco Revisited) takes another look at the opening case study from Chapter 1. In addition to reorganizing topic coverage, the authors also added new examples throughout the book, selecting them from a wider array of scenarios, in line with the interests of students and the many majors that require the course. Data and problems are real rather than hypothetical. Encourages students to be active participants in the classroom through activities and dialog. Due to the emphasis on a variety of technologies such as graphing calculators and software, the text features many graphical displays and computer printouts. Realistic models are provided for design and analysis of experiments and surveys at an intro level.